In my final post on the Tour de France last Monday night, I mentioned that watching the closing stage of the race delayed our departure for Walla Walla, where we would be touring wineries in the Walla Walla Valley of southeastern Washington. We did get there, in time for dinner last Sunday, and returned to Seattle Wednesday late afternoon. Between the trip and subsequent catching up on other things, Ron’s View has been quiet. Time to crank it up again. I’ve long wanted to go to Walla Walla, as much to see that part of the state and visit the Whitman Mission National Historic Site as to taste the wines. But I’m not a big fan of driving, so we never got around to heading over there. When a fully-arranged trip was offered as an auction item three months ago, I realized that this was our chance. By buying it, we could be sure at last to make the trip. And so we did. Sunday was driving day. Monday we visited four wineries. Tuesday we visited four more. Wednesday we took a quick walk around Walla Walla’s Whitman College, drove west a few miles to the Whitman Mission, then headed home. I’ll say more about each, in separate posts. This post is about Sunday. Our Sunday drive got off to a slow start, thanks to our need to watch the cycling and then the conclusion of the men’s Open Championship golf from northwest England. We were hardly 20 miles into our 278-mile drive when we pulled off in the Seattle suburb of Issaquah for lunch. And a fine lunch it was, at an absolutely mobbed Panera. Who knew that that’s where everyone in the neighborhood goes on a Sunday afternoon? It was discouraging, getting back in the car an hour into our trip, to realize we had made such little progress. As we continued east on I-90, I was stunned to realize that I couldn’t for the life of me remember the last time we crossed Snoqualmie Pass, the major pass through the Cascades. Once over it, we left the clouds behind for good. One of the wonders of driving across the state — which I have done so rarely — is the dramatic change one encounters in geology and climate. As we continued east to Ellensburg, the landscape got drier and drier. This I had seen before, but at Ellensburg we left I-90 for I-82, which initially dips southward to Yakima, and almost everything in the remaining 170 miles was new territory. The 35-mile stretch down to Yakima is spectacular. It is almost entirely undeveloped, courtesy of the US Army and the firing range that runs from I-82 east all the way to the Columbia River, and from I-90 south to Yakima. The road travels up and down and up and down and up and down, over the Manastash and Umtanum Ridges, making one final descent into Selah and Yakima. We pulled off in Yakima for gas, and to see the city, the first time for me and the first time since early adulthood for Gail. Various cousins of Gail’s have lived or grown up there. We didn’t see a whole lot, but did drive the length of downtown, and got to visit an am/pm convenience store. Then it was back to the freeway and on through the farming towns I have stared at so often on the map, and had taught students from, but had never seen: Wapato, Toppenish, Sunnyside, Grandview, Prosser. This is wine country now, home to a long list of wineries, but country we will have to wait to spend time in. Once out of Prosser, the road climbs again, as it continues east 30 miles to the Tri-Cities: Richland, Kennewick, and Pasco. We crossed the Yakima River one last time as we dropped into the Columbia River Valley, the Yakima’s final destination. This was a familiar stretch for me. Seven summers ago, I flew over to Pasco one morning for a four-hour meeting at Pacific Northwest National Laboratory, the huge US Department of Energy research lab associated to the Hanford nuclear site (where plutonium for atomic bombs was made for decades, starting during World War II). From the airport that day, I drove over to Richland, had some time to kill, parked at some small park I found by the Columbia, walked along the river for a while, grabbed an early lunch at a Subway that seemed to fill with PNNL staff shortly after I got there, then headed up to PNNL for the meeting, after which I headed straight back to the airport and flew home. Thanks to that visit, as we drove down into the valley, through Richland, and over the Columbia River, none of this was ne to me. But Gail hadn’t been past Yakima before, so she was seeing the Tri-Cities for the first time. Parched though the region is, it looks like it has its attractions, starting with the Columbia itself. As the Columbia flows south, it separates Richland to the west from Pasco to the east. But then the Columbia makes a sudden turn eastward, becoming the line between Pasco to the north and Kennewick to the south. On the east side of Pasco, the Snake River flows southward, joining the Columbia at the edge of town. 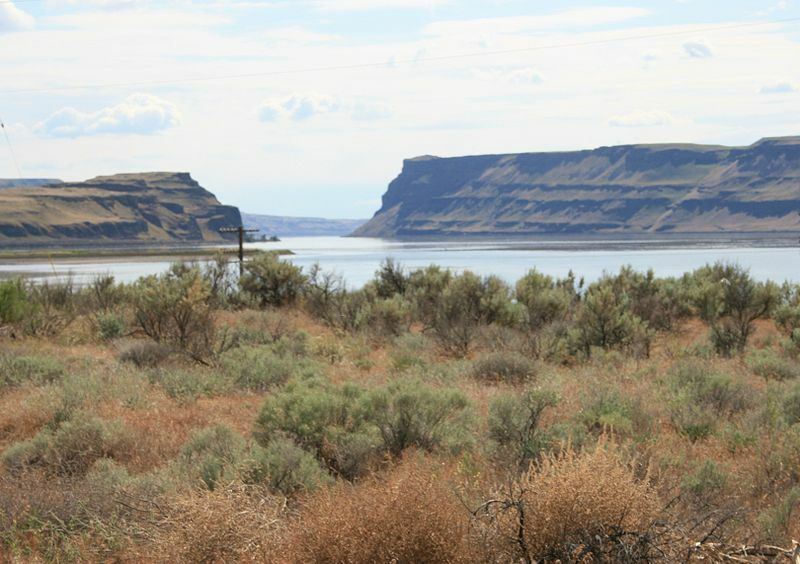 This is a historic confluence, the point where Lewis and Clark arrived at the Columbia two centuries ago, and we could see it plainly off to the right as we drove east on US-12 over the Snake. We will surely want to explore it next time we get over there. For the next 20 miles, we followed the Columbia downstream as it curved from an eastward heading to southeast to southward, until we could see in the distance as dramatic a geological formulation as the Columbia offers: the Wallula Gap. We would not pass through it. US-12 veers east just before entering it, with Walla Walla 30 miles away. We stared at it in awe, learning only the next day how important it is to the geology of southeast Washington. For the gap plugged up the immense flow of water from the Missoula Floods 15,000 years ago, a flow perhaps as large as that of all today’s rivers in the world combined, one that removed the loess covering eastern Washington and produced today’s landscape. It’s quite a story, but I’m not the one to tell it. Fortunately, joining us on our trip as of the next morning was our geologist friend Stan, gifted teacher and author of a best-selling standard text. As we stood in a vineyard looking out at the Blue Mountains, he recounted the dramatic days of that long ago flood. But this lay ahead. On Sunday, we drove away from the gap in ignorance, knowing only that it sure looked dramatic. From the Columbia Valley, we made one final climb. Soon we saw our first Walla Walla wineries, Woodward Canyon and l’Ecole No 41. And then, ahead to the left, there was Walla Walla’s state penitentiary. That was our cue to get off US-12. A couple of miles on local roads and we pulled into the Walla Walla Hampton Inn, five hours after leaving home. What next? We still had dinner to eat. And there in the parking lot, emptying their car were our tripmates Russ and Tobae. Once we were all settled, we agreed to eat in town at Saffron Mediterranean Kitchen. Russ looked at the menu as we talked, but I didn’t ask him about it. I just imagined the place was a standard middle-eastern restaurant, which sounded good to me. We arrived to learn that it was fully booked, but we could sit at one of the tables in the small enclosed outdoor section on the sidewalk, which we agreed to do. Only on looking at the menu there did I realize that it’s an upscale place, and only the next day did I learn that it’s considered one of Walla Walla’s two top restaurants. For good reason. It’s excellent. Three of us went with the evening’s soup special, an intriguing blackberry gazpacho. Gail had a fingerling potato appetizer that she raved about. Then three of us had the leg of lamb, described on the online menu as having spiced basmati rice, pistachios, yoghurt, cilantro, and raspberry harissa. I can’t remember if that’s quite right. I do remember that it was delicious.